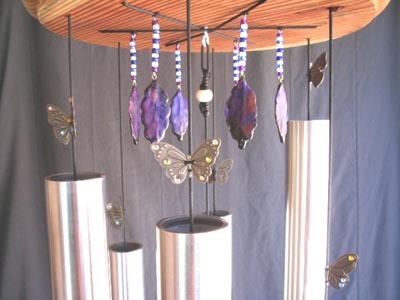 2 inch Tuned Wind chimes by SpiritualFlyer! 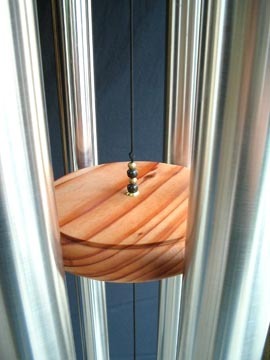 This is an example of a set of 2 inch symphony quality wind chimes which are tuned to a mild (Tenor) E minor Pentatonic scale. 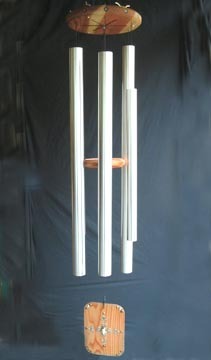 The polished aluminum tubes for our “SpiritualFlyer Wind Chimes” are crafted to be of the highest quality and produce the best possible sound. These extraordinary chimes will resonate for up to 3 minutes from the first strike to the last whisper. 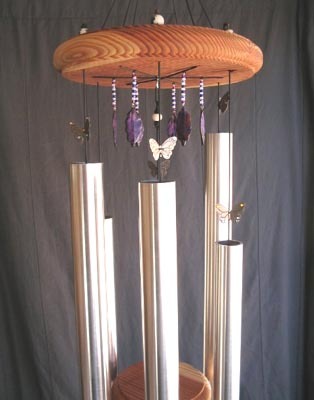 A wind chime tube is a very complex musical instrument. In order to achieve the maximum level of resonance and maximum sound quality each diameter of tubing has been tuned to its own optimum level of impedance. This causes each tube to vibrate at its maximum level in a clear and clean manner resulting in the highest level of sound quality and resonance possible. Because of the chime tube’s complexity it will only produce quality sound for about 14 notes (including sharps and flats). This is referred to as the “Critical Octave.” Within the critical octave there is a “Critical Frequency” representing the highest quality of sound. This critical frequency is found at the lower end of the critical octave. To achieve the best sound quality we use the larger 2 inch tubing for the lower three notes and the 1 ½ inch tubes for the higher three notes, putting all tubes right up against their critical frequency and creating sound that is “The Best of the Best”. 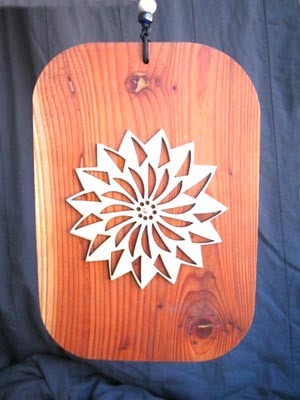 The top disk, clapper (striker), and sail are made of Redwood and sealed against the elements with a clear water sealer so that the natural beauty of the wood remains. The hanging string is braided Dacron made especially for wind chimes. They are extremely durable, strong, and have the ability to withstand the weather. 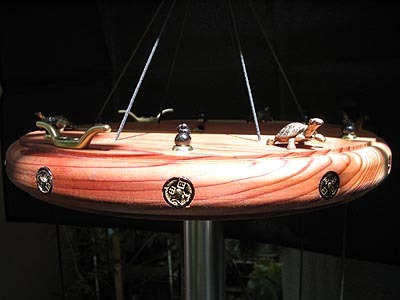 All of the accent pieces on the wind chime are brass and the beads are made of bone. 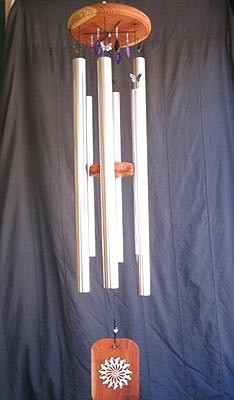 This set of symphony quality Chimes are tuned to A minor. The tubes themselves consist of 3 each 1.5 inch and 3 each 1.25 inch tubes. The description above explains the reasoning for this. The longest tube measures 27 1/2 inches. 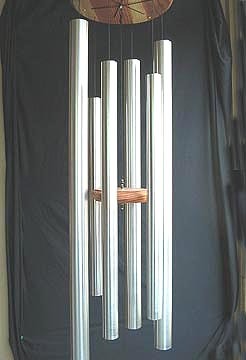 The overall length of this chime set is apx 52 inches. 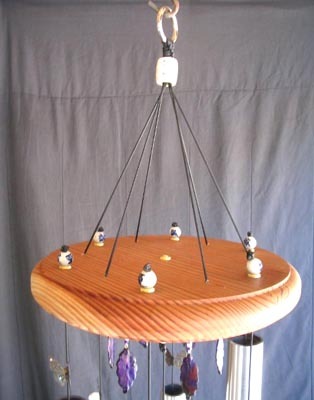 The chimes are accented with glass, porcelin and bone beads. The top hanger bead is bone. The top disc beads (white and blue) are porcelin. The clapper and sail beads are bone and glass. 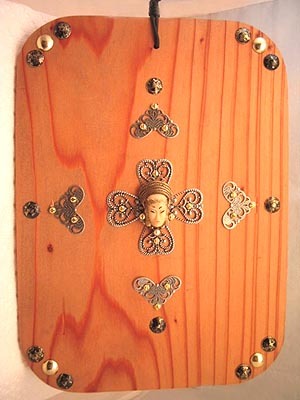 The leaves are hand painted wood and are accented with glass beads. The Butterflies have colored stone accents. The tubes themselves are finished with a brushed alluminum appearance. The redwood is treated with Thompson's water seal. This Set is Sold. Scroll down for available sets.